Earlier this week I had the absolute pleasure of hanging out with French food stylist Elodie Bellegarde at her home. Elodie and I have known each other for a couple of years but rarely find the time to meet so it was lovely to spend time with her, chatting about living away from our home countries, bringing up kids in a mixed nationality household - and of course, all things food, photography and styling. Elodie has a Masters in Culinary Arts and is in demand for her food styling talent. Her beautiful instagram account @elodbelle is always one that makes me stop in my tracks and double tap a ‘like’. She is also a published cookbook author and runs Food Styling and Photography workshops in Singapore which always sell out. But more than this, she is a wonderful cook - so when I suggested a meet up, I also suggested she cook me something typically French - something she would enjoy with her family and that I hadn’t made before. So while I sipped a delicious coffee (pausing every now and then to take photos) Elodie chopped, sliced and diced and produced this wonderful rustic French galette for me to photograph and share with you here. Start with the pastry. In a large bowl, mix with your hands the flours, salt, verbena (or herbs). Rub the butter into the flour mix until it resembles breadcrumbs. I like to get my hands dirty, so I have a preference for doing it by hand but if it isn't your thing, place these same ingredients in a food mixer and mix until breadcrumbs form. Add some iced water, a little bit at a time until the dough just comes together - it should come together without being soggy or too crumbly. Give it a couple of kneads and form a ball. Refrigerate, covered, for 30 minutes while you get on with the tomato filling. Finely slice the onions and half or quarter (depending on size) the tomatoes. Heat a medium saucepan over low heat and with a couple tablespoons of olive oil and a knob of butter. Add the onions and cook for 3 to 4 minutes until the onions start to soften. Add the tomatoes and cook for a further 5 minutes. Add the balsamic vinegar, season to taste, stir and partly cover the saucepan. Leave to simmer for a good 10 minutes. Turn off the hob, uncover the pan. If you find the filling too watery, cook for a further 3 to 5 minutes, uncovered on high heat so it thickens a little. You should get a mix of crushed tomatoes and some juice. Tear the basil and add to the filling. Preheat the oven to 180ºC. Take the pastry out of the fridge and roll it to a thickness of about 1/2cm. It doesn't need to be even or perfect. Sprinkle the pastry with a thin layer of semolina. This will prevent the bottom of the galette from being soggy and soft. Cover the pastry with the tomato filling leaving about 3 to 5 cm around the edge of the pastry to fold over the filling. Pinch, overlap and fold the sides of the pastry. The galette is rustic and simple so don't look for perfection here. Bake in the preheated oven for 20 to 25 mins or until the sides of the galette are turning a pale shade of brown. Serve with a sharply dressed salad for a light lunch or dinner. Figure out your background. Here, Elodie used a tile to provide a neutral back drop that had a rustic feel - connecting with the style of the dish. 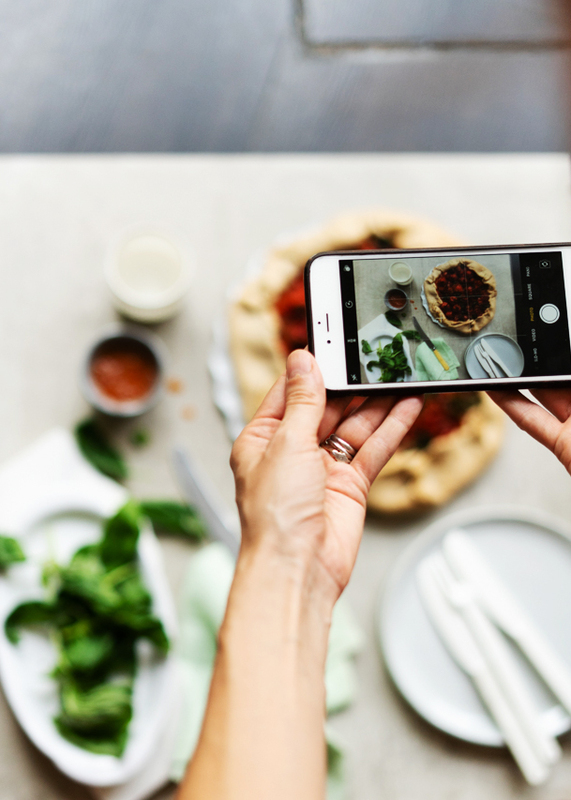 Decide how you will be shooting the dish as this will inform your styling choices. Because the galette is flat, we knew that most (if not all) of the shots would be taken from above so chose the plates and accessories accordingly. Find some styling items that will help to tell the story of the dish - a napkin, a knife, some cutlery and plates - these all help to tell the story of food that will be shared with others in a relaxed setting. Add some interest and colour with ingredients that you have used in the dish. 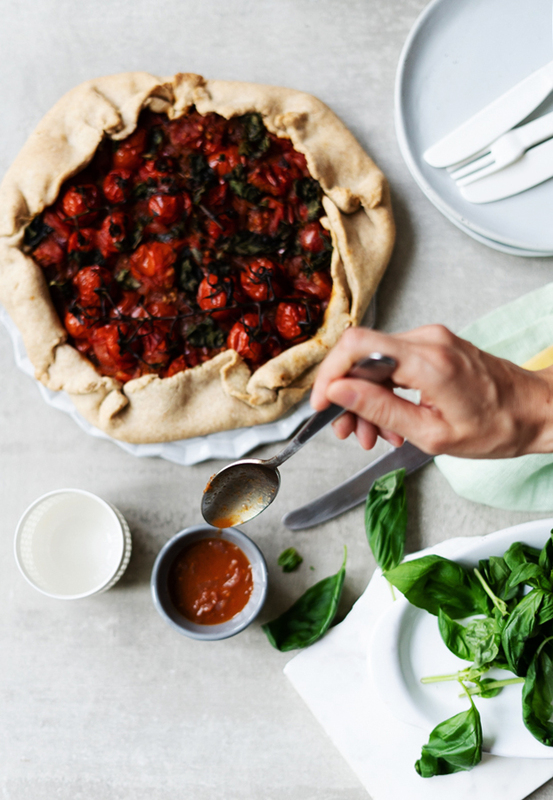 To reference the ingredients used in the dish Elodie placed fresh basil and a little pot with the left over tomato juices from the galette filling in the styling. Once you have your styling items figured out, play around with their placement. To do this, you must look through the camera. What looks right to the naked eye might not translate when you look through the lens. Keep looking through the camera and move things in place accordingly - you may need to add things in or take things out. how did i shoot this article? I took a total of 99 images for this article using the Sony A7R III fitted with a 50mm 1:4 lens. ISO 800 / shutter speed varied / f between 2 and 3.2. Editing was done in lightroom and finished in photoshop. Until next time, happy home cooking.